With this product, you earn 416 loyalty point(s). 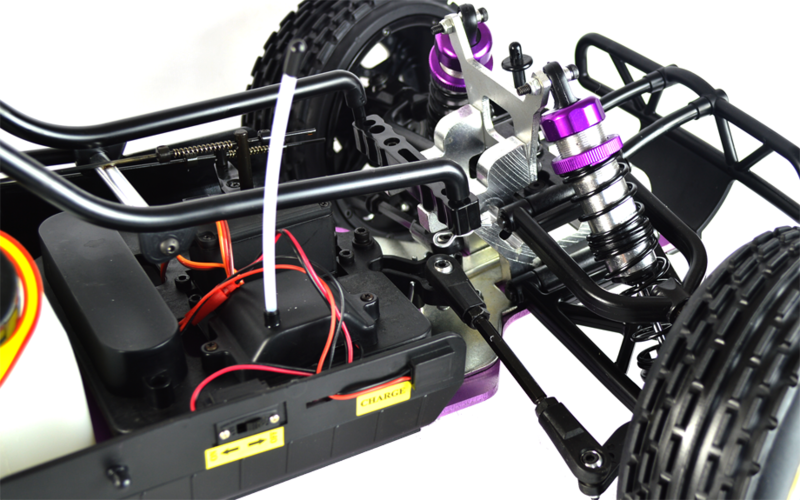 Nitrotek are proud to introduce you to the exquisite 1/5th YAMA BUGGY 26cc Petrol RC Buggy from AoWei. Until now RC cars that run on actual petrol have been very expensive with prices starting at over £700 for a model including all equipment and electronics that made them a very specialist and exclusive product. We are pleased to announce, that this great model is now available to everyone at a very realistic prices. Seems to good to be true? There are two main factors that have made this possible. Firstly, unlike other manufacturers, AoWei make almost all the parts and engine in the same factory, and saves this way on transport and labour. The second reason is that due to the price being much lower and therefore sales being much bigger, they can be manufactured and imported in bigger quantities which save on component and logistics costs. The whole car has been built with quality in mind. Aluminium chassis, aluminium alloy parts like spur gear, aluminium suspension, 2.4Ghz radio equipment and the 26cc high performance engine gives this model massive amounts of power and torque propelling the model up to speeds of 80 km/h (56 mph). Unlike a nitro car, the petrol radio controlled car runs on a mix of normal unleaded petrol and 2 stroke oil. Both of these are available from any petrol station which makes them more practical and cheaper to run than a nitro model. Mixing the petrol is very easy as included in the package is a mixing bottle. You simply pour in some unleaded petrol up to the marker on the bottle and then top up to the second marker with the 2 stroke oil. This oil is usually found inside petrol stations with the other oils. If you look at other 1:5 scale petrol radio controlled cars on the market you will see even though they are more expensive they usually don't include everything you need and you have to go out and buy your own radio equipment, special 1:5 scale steering servo, electronics battery pack and charger. 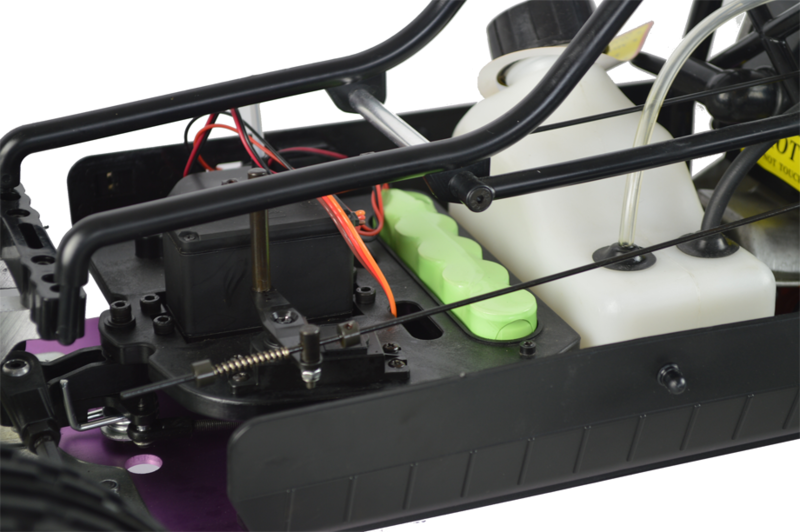 With the YAMA BUGGY package everything you need is included, even a high capacity rechargeable battery pack with U.K. charger and a tool kit with all the tools needed to maintain the buggy, this makes our packages the best on the market. 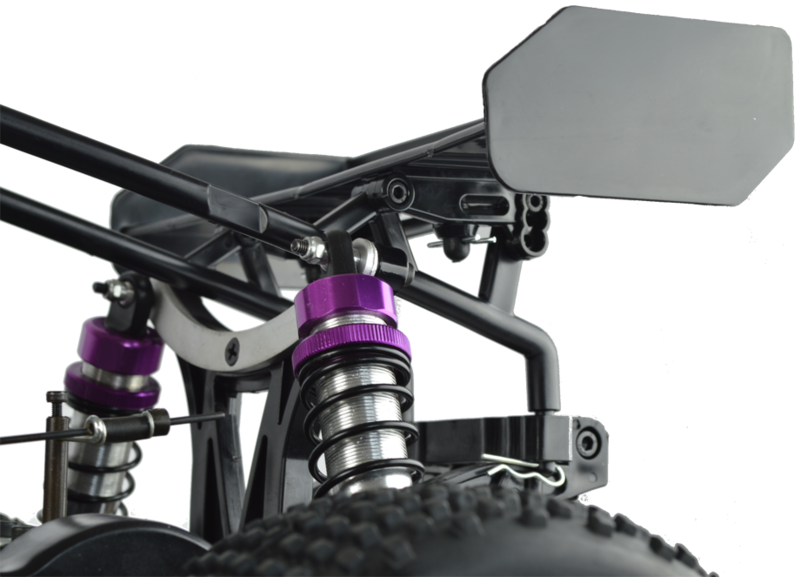 The Yama Buggy has a stunning look with oil filled colour coordinated suspension shocks. The suspension will provide you with a superb feel on uneven surfaces. 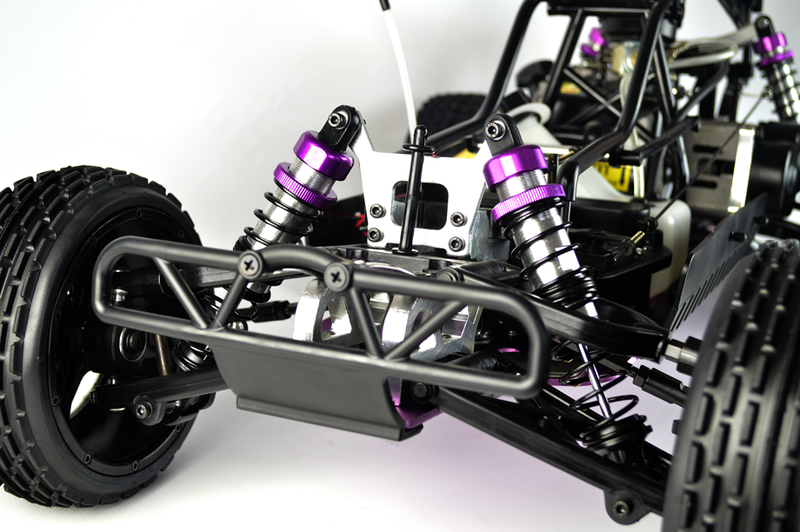 The Yama Buggy is built up with multiple aluminium parts. 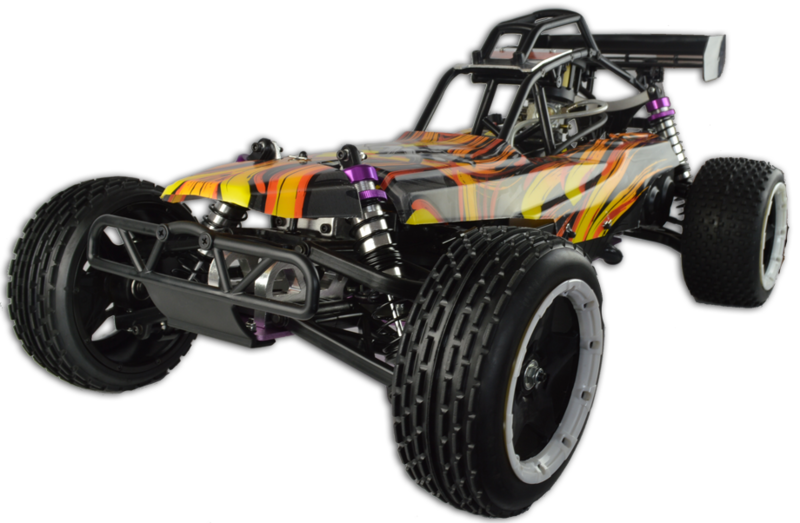 With this high quality buggy you are guaranteed to hit high speeds when driving. 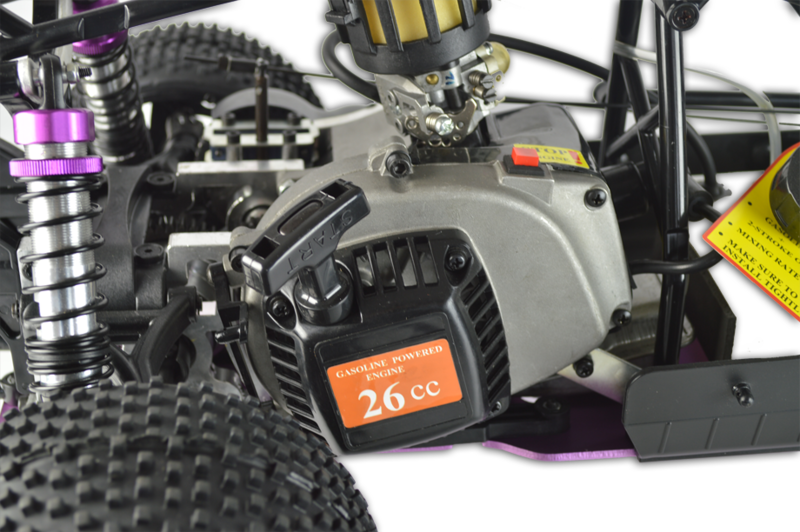 The acceleration of this buggy is very impressive and equipped with a responsive and reliable brake system; you will not need to worry about stopping when hitting high speeds. 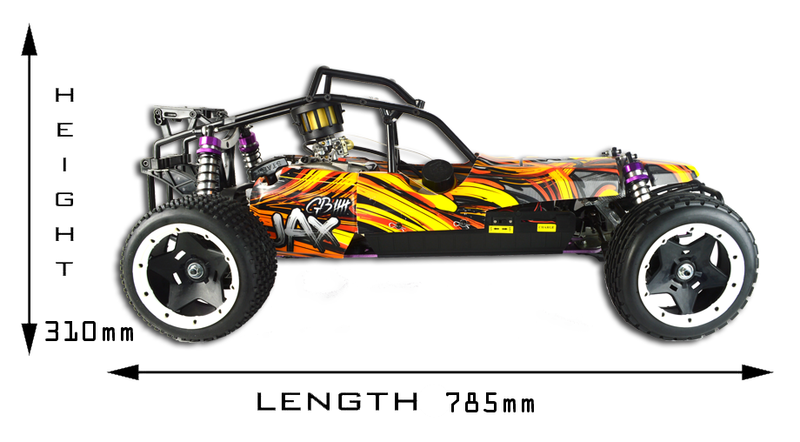 The buggy is set up with a 2.4GHz radio system with high performance - 17000 rpm engine and a special clutch system. The angle of the wing can be changed to adjust the amount of downforce. 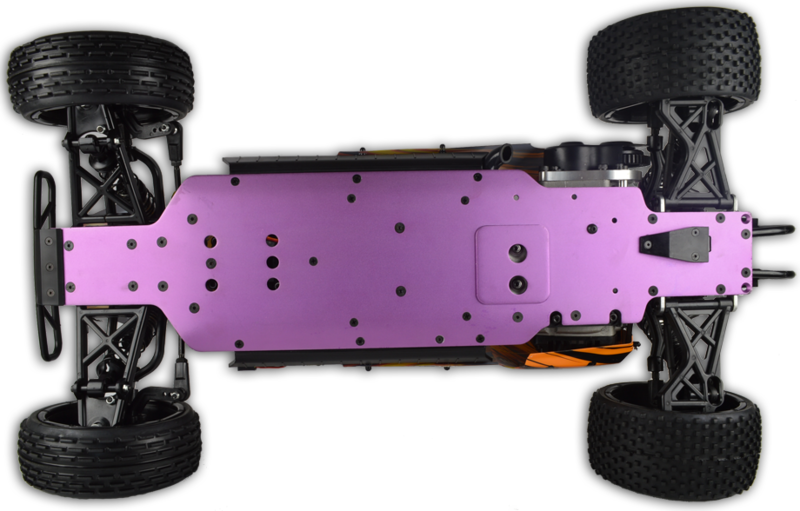 Aluminium chassis with countersunk screws. The gears are covered to protect against dust and grit. The car measures 785mm x 310mm x 450mm. The engine runs on normal unleaded petrol mixed with normal 2-stroke oil, both available from petrol stations. Disc brakes give ultimate stopping power at high speeds. 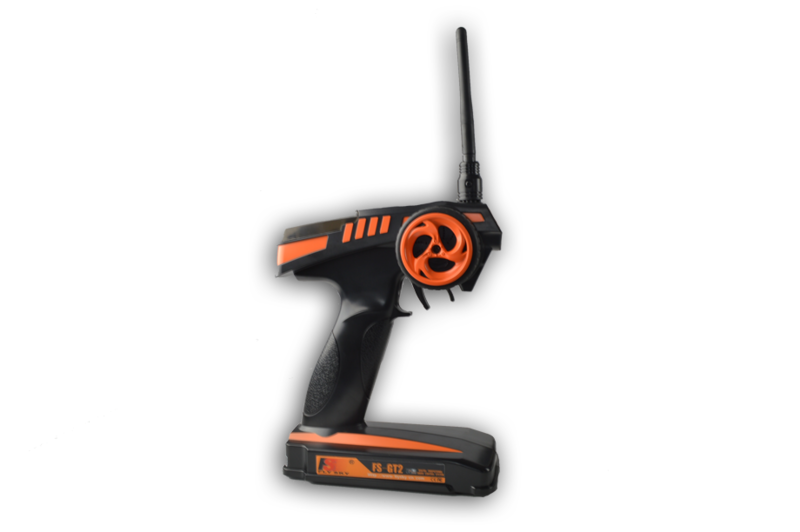 The servos and radio receiver are powered by an included rechargeable battery pack so you do not need to keep replacing normal AA batteries like you do on other models. 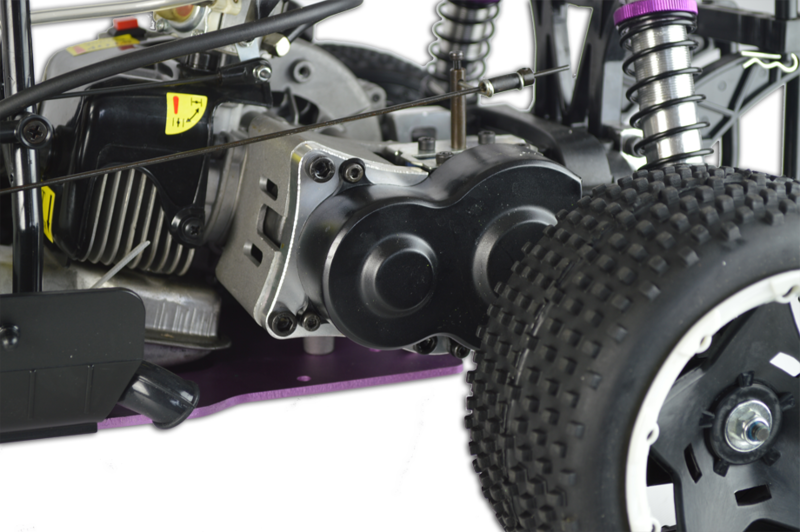 An extra large and strong steering servo is used to handle the extra power, speed and weight of the model. 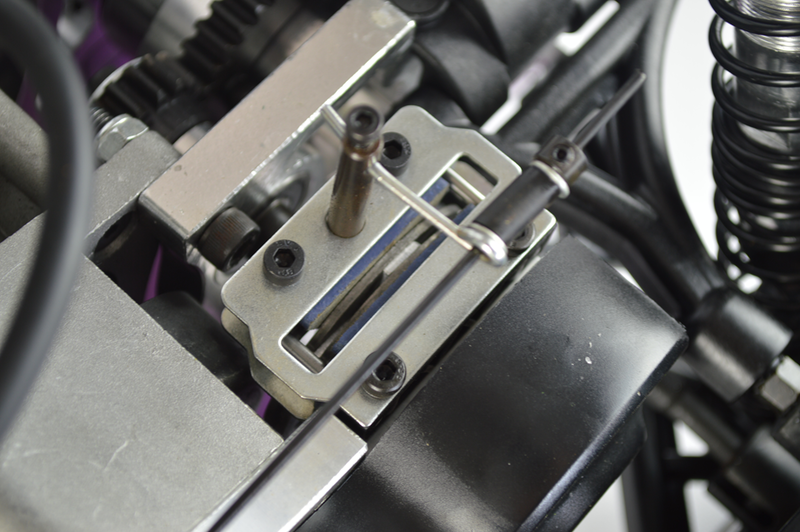 Independent aluminium shocks on each wheel are connected to solid aluminium shock towers for increased strength.